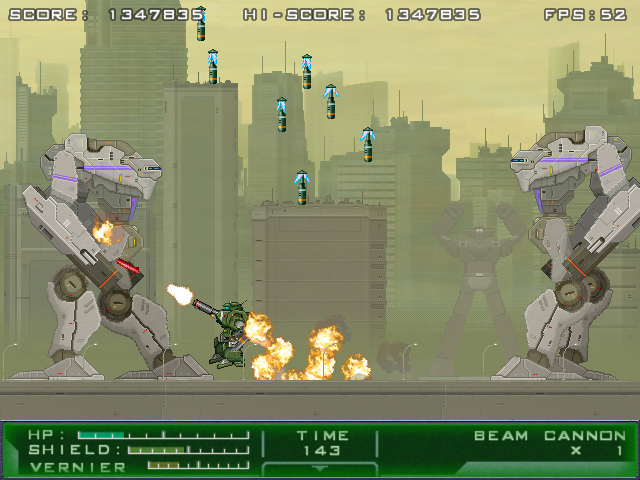 The 16-bit side-scrolling mech shooter GIGANTIC ARMY came out on Steam on March 6 and feels like the arcade games I played more than 15 years ago. I would rather this game stay in the past with the other arcade games from that part of my life. GIGANTIC ARMY takes less than a hour to beat in a single run, and you have to beat it in one go. In the arcade game style you have four lives, including the one you start with, to make it through the game’s six levels. Which aggravated me when I tried to fit it into the small windows of time I do have available. The game is not forgiving in either its features or design. Juggling multiple enemies at once is difficult, doing it with sluggish controls and bad design choices makes it even harder. Often I found myself fighting the design of the game, blocking the wrong way, enemies acting inconsistently or not at all, items that do not offer any value and a timer that only annoyed me. At the start of the game, you can pick between three primary weapons with unlimited ammo and three secondary weapons with finite ammo. The stronger the primary or secondary weapon, the less ammo for the secondary weapon you get. Personally I choose the strongest primary and secondary weapons which let me kill almost any enemy in one hit on the medium difficulty. However, I played around with the different weapon combinations and no matter what I picked, I just walked through the level holding down the fire button the whole time. Between each level you regain a small amount of health, ammo for your limited use secondary weapon and energy for the mech’s shield. 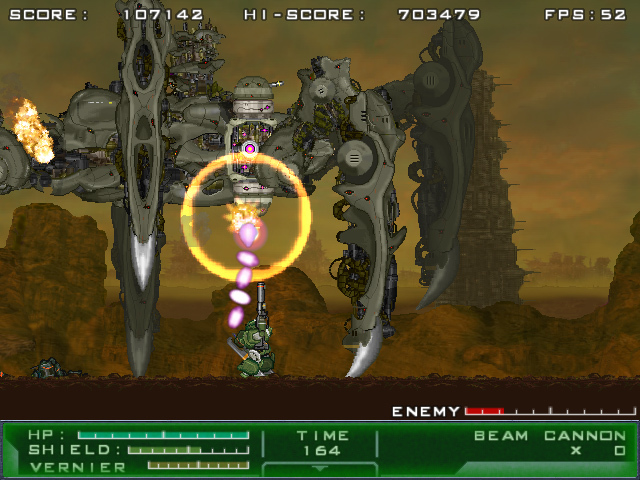 During each level, the player has about 3 minutes to beat the two to three bosses and finish the level. Along the way you can also pick up additional health, time and other resources. When I finished a level I got a little health back, advanced a plot that could not hold my attention and received absolutely no incentive to keep playing. I am not saying the game needs to rip me out of my seat and toss me into a deep and involved story. Even a simple weapons or armor upgrade would have given me some feeling of accomplishment, however, the GIGANTIC ARMY just gave me a different level. GIGANTIC ARMY has four difficulties, anything harder than normal gets unlocked upon completing the game. However, the real difficulties I faced came from the design, not the features. 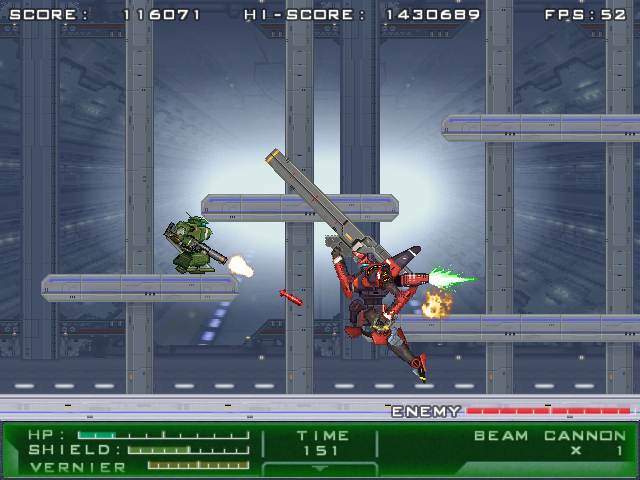 The game offers some information about the story, piloting a mech in the not-so-distant past of 2009 to fight aliens, however it does not have any information about how to play it. The game gives you no information about how to do simple things such as dashing, done by double tapping a direction. I only found out how to dash by accident on my third attempt at the game. Moving and shooting become frustrating by the middle of the second level. You aim and move with the same keys, which means that you cannot adjust your aim and move at the same time. That control scheme means that if you are firing at a boss while backing away, stop firing to use your shield, you will instantly turn around and deploy the shield in the wrong direction. It fails to explain so power ups that seem to have no immediate effects. I do not remember once yelling at the game because a well designed boss or enemy beat me. I do remember cursing more than a few times because I died from an attack I should have blocked or an enemy I should have dodged if the controls worked correctly. While the control frustrated me, the visuals entranced me. The retro style and classic sci-fi art direction were almost enough to keep me playing. Booting up and starting the game feels, sounds and looks just like an old arcade game. The player and enemies in GIGANTIC ARMY look fun and the backgrounds in most levels look great. Even most of the final bosses look like some sort of violent robot toy from the 90s. Even the sound effects have their own “so bad, they are good” charm to them. While GIGANTIC ARMY might not be for everyone, it could be the right game for you, if you enjoy 16-bit mech shooters or want to feel some arcade game nostalgia. GIGANTIC ARMY was reviewed on Steam and was provided for us to review. Review scale here. Have you played Intrusion 2? It’s awesome in this way but feel more like a console game rather than an arcade game.